It’s Christmas season! Who wants free books and some yummy goodies??? I am giving away autographed-by-me copies of the Of Rags and Riches collection (which includes my story Union Pacific Princess) and the First Love Forever Collection (which includes my story, Heartfelt Echoes). Also included is a package of biscotti and a sampling of different teas. Journey along in nine historical romances with those whose lives are transformed by the opulence, growth, and great changes taking place in America’s Gilded Age. Nine couples meet during these exhilarating times and work to build a future together through fighting for social reform, celebrating new opportunities for leisure activities, taking advantage of economic growth and new inventions, and more. Watch as these romances develop and legacies of faith and love are formed. In the hell-on-wheels rail town of Cheyenne, grieving Boston socialite Dara Forsythe must choose between her estranged father; Connor, a bigwig with the Union Pacific Railroad; and Gage Wells, a former Confederate sharpshooter bent on derailing the Transcontinental Railroad’s progress. Other authors in this collection are Susanne Dietze, Kathleen Y’Barbo, Natalie Monk, Michelle Griep, Erica Vetsch, Jaime Jo Wright, Anne Love, and Gabrielle Meyer. In settings from 1865 to 1910, nine couples are thrown back on the same path by life’s changes and challenges. A neighbor returns from law school. An heiress seeks a quick marriage. A soldier’s homecoming is painful. A family needs help. A prodigal son returns. A rogue aeronaut drops from the sky. A runaway bridegroom comes home. A letter for aid is sent. A doctor needs a nurse. Can love rekindle despite the separation of time and space? 1875—Virginia City, Nevada: A short, urgent letter mentioning his childhood love, Millie Gordon, forces deaf Travis McCaffrey to turn to his estranged birth father for help rescuing the woman he can’t forget. Other authors in the collection include Susanne Dietze, Cynthia Hickey, Marcia Gruver, Carrie Fancett Pagels, Martha Rogers, Lorna Seilstad, Connie Stevens, and Erica Vetsch. That’s eighteen novellas by fifteen different authors, plus tea and biscotti to enjoy while you read. Leave me a message telling me you’ve followed and which collection you’re most excited about. Be sure to include your email address so I can contact you if you’re the winner. The drawing of the winning name will be on the evening of Thursday, December 20. Good luck, everyone, and Merry Christmas! This entry was posted in Giveaway and tagged Barbour, Christmas, First Love Forever Romance Collection, Giveaway, Heartfelt Echoes, Jennifer Uhlarik, Novella, Of Rags And Riches Romance Collection, Union Pacific Princess on December 12, 2018 by jenniferuhlarik. Today is an anniversary. A terrible one. On this day one-hundred-fifty-four years ago, Colonel John Chivington led an army force of 700 men through the night to surround a peaceful encampment of Cheyenne and Arapaho Indians. Only weeks before, this very same colonel had promised Black Kettle and other chiefs of these tribes a peace treaty. They’d been instructed to fly the American flag and a white flag over Chief Black Kettle’s tent, and as long as those flags remained in place, the tribes would be at peace with the Army and Colorado’s territorial government. But on November 29, 1864, just moments before dawn, Colonel Chivington’s men were instructed to fire on the sleeping encampment. Within the tents, there were mostly women, children, and the elderly. The fighting-aged men had gone to their hunting grounds to lay in food for the winter as they awaited the peace treaty. If you’re interested in reading more of the true history of what led to this horrendous attack and what happened during and after, please see my blog post on the Heroes, Heroines, and History Blog. And keep watching there for more information about the historical players involved in this attack (my blogging day is the 25th of each month–though I won’t be blogging about the massacre on Christmas day. LOL). In upcoming posts, I will be delving more deeply into who the historical players were and why they acted as they did. 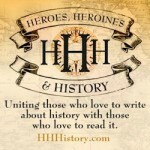 Speaking of…if you love history, follow Heroes, Heroines, and History. Thirty historical fiction authors have banded together to write a posts on historical topics every day of the month–a new post and new topic every day. Also, if you want to be kept in the loop of what’s upcoming with me, please be sure to follow my website for updates! This entry was posted in History and tagged Anniversary, History, Jennifer Uhlarik, Sand Creek Massacre on November 29, 2018 by jenniferuhlarik. I have some exciting news! As of a few weeks ago, I signed my tenth contract! The Cameo Courtships Collection will feature four historical romance novellas set between 1852 and 1895, with two stories taking place in Pennsylvania, one in Colorado, and one in Louisiana. The idea behind the collection is that an heirloom cameo, once owned by Queen Victoria herself, is passed between various memebers of a family, and while in possession of the piece, each heroine will find her love of a lifetime. My story, titled Taming Petra, is about an unladylike, buckskin-clad frontierswoman who falls for a straight-laced preacher. The two team up to retrieve the heirloom cameo she loses to a cheating brothel owner during a high-stakes poker game in 1875 Colorado. I’ll begin writing this story in the next week or so, and the collection will release on June 1, 2019. Hope you’ll look for the Cameo Courtships Collection, as well as my two other 2019 releases–my first novel, Sand Creek Serenade (coming in March) and another 4-in-1 historical romance collection, Smitten Presents: The Cowboys (coming in August). And as always, thank you for your support! This entry was posted in Contract News and tagged Barbour, Cameo Courtships Collection, Contract News, Jennifer Uhlarik, Novella, Taming Petra, Western on July 29, 2018 by jenniferuhlarik. I am happy to share the 2018 Selah Award Finalists. There are some wonderful books and authors on the list, and I’m humbled that two of my titles are listed among them! The Outcast’s Redemption from “The Secret Admirer Romance Collection” made the cut in the western category. Union Pacific Princess from “Of Rags and Riches Romance Collection” was among the novella finalists. Such a great honor! Winners will be announced at the Awards Ceremony of Blue Ridge Mountain Christian Writers Conference on May 23, 2018. The ceremony will also be available on Facebook Live. Congrats to all my fellow finalists!!! Here is the complete list. This entry was posted in Contest News and tagged Barbour, Jennifer Uhlarik, Novella, Of Rags And Riches Romance Collection, Secret Admirers Romance Collection, Selah Award, The Outcast's Redemption, Union Pacific Princess on May 7, 2018 by jenniferuhlarik. So I had a real thrill recently. I had the pleasure of signing my first-ever contract for a full-length novel on Monday, March 19, 2018. Smitten Historical Romance will be putting my novel, Sand Creek Serenade, out in about a year. Here’s me signing the deal! Sand Creek Serenade is a historical romance set in 1864 Colorado Territory. My heroine, Sadie Hoppner, is a young female doctor finishing her medical studies under the watchful eye of her older brother, Dr. Ben Hoppner. They both practice medicine at Fort Lyon where Ben is the fort’s surgeon and a Captain in the Army, and where Sadie has received special permission from the post’s commander, Major Ned Wynkoop. Sadie receives attention from both her brother’s best friend, Lieutenant Gabriel Farrington, and also the Cheyenne brave, Five Kills. You’ll have to read the story to find out who the real hero is! I’ll keep you posted on release date, the cover, and any other pertinent information as we get closer to this story’s big day! Thanks for your interest! This entry was posted in Contract News and tagged Contract signing, Jennifer Uhlarik, Novel, Sand Creek Serenade on March 25, 2018 by jenniferuhlarik. Hi all! Jennifer Uhlarik here. I’m so excited to share with you the story behind the story on The Brigand and The Bride, my selection from The Mail-Order Brides Collection. So…where did the idea for this story come from? As I pondered the idea of a mail-order bride story, I knew it needed to be different than a previous mail-order bride story I’d done (Wedded to Honor from The Convenient Bride Collection). I began thinking of different scenarios and quickly struck on the idea of a woman marrying a stranger to escape her outlaw family. Probably not the most original of ideas—but then, every story’s been told a million times already. It’s the fun twists you add that makes a story unique. So as I pondered the heroine that was taking shape in my mind, I saw a scene begin to unfold. The heroine hurries through town, anxious about being caught by her brother. Rather than heading straight to the church, she stops in the seamstress’ shop to pick up a suit for her mail-order groom—something they’d pre-arranged through their letters. Suit in hand, she goes to the church, lays out the clothes and grooming supplies for him, then waits in the sanctuary. A bit later, the hero rushes in, shaves and cuts his hair, dons the suit, and steps out of the room, where the pastor’s wife shoves him down the aisle, scolding him for his lateness. The scene played so vividly in my mind’s eye that I knew I had to write it and find out how the rest turned out. From the couple’s first awkward face-to-face meeting to the “quickie” wedding that ensues, I was giggling and grinning ear-to-ear. I sure hope you’ll read The Brigand and The Bride to find out why! Jennifer Uhlarik discovered the western genre as a pre-teen when she swiped the only “horse” book she found on her older brother’s bookshelf. A new love was born. Across the next ten years, she devoured Louis L’Amour westerns and fell in love with the genre. In college at the University of Tampa, she began penning her own story of the Old West. Armed with a B.A. in writing, she has won and finaled in numerous writing competitions. In addition to writing, she has held jobs as a private business owner, a schoolteacher, a marketing director, and her favorite—a full-time homemaker. She currently writes historical novellas of the American West for Barbour Publishing. Jennifer is active in American Christian Fiction Writers and lifetime member of the Florida Writers Association. She lives near Tampa, Florida, with her husband, college-aged son, and four fur children. This entry was posted in Uncategorized and tagged Barbour, Jennifer Uhlarik, Story Behind The Story, The Brigand and The Bride, The Mail-Order Brides Collection on February 11, 2018 by jenniferuhlarik. I am thrilled to announce that The Courageous Brides Collection placed at #16 on the Evangelical Christian Publisher’s Association (ECPA) Bestseller List for fiction during the month of September. Thank you, Readers!!! It’s because of you! This entry was posted in Bestseller List and tagged Barbour, Bestseller List, ECPA, Jennifer Uhlarik, The Courageous Brides Collection on September 4, 2016 by jenniferuhlarik.